Arabella Huntington was one of the most colorful and certainly among the wealthiest women in America in the 19th and early 20th centuries. The long-time mistress of the married and much older millionaire Collis P. Huntington (she was 19 when they met, he was 44), she bore a son on March 10, 1870. He was said to be the son of her "husband," John Worsham (in fact he had a wife, Annette, back home in Richmond, Virginia). Worsham returned to Richmond in 1871 and New York society whispered that Archer Milton Worsham was Huntington's child. Following Elizabeth Huntington's death from cancer in 1883 Arabella and Collis were married. Archer, 12 years old at the time of the marriage, took on the railroad tycoon's surname. While Huntington was known as being uncouth, uneducated and, according to newspapers, "ruthless" and "scrupulously dishonest," Arabella had been educated in private schools, spoke French, and was refined in her speech and manners. While many American millionaires collected paintings and statuary because it was expected, not because they understood good art from bad; Arabella studied art history and filled their mansion at No. 2 East 57th Street with masterworks by artists including Anthony Van Dyck, Frans Hals, Theodore Rousseau. and Joshua Reynolds. And when she toured the museums and galleries of Europe, she took young Archer along. He developed a love for art and architecture that became his passion. Although Huntington attempted to interest Archer in the railroad business, the young man was focused on art and culture. When his step-father died on August 13, 1900, the 28-year old found himself suddenly a multimillionaire, with him all the money and time he needed to devote to the arts. In 1904 he embarked on a momentous project. 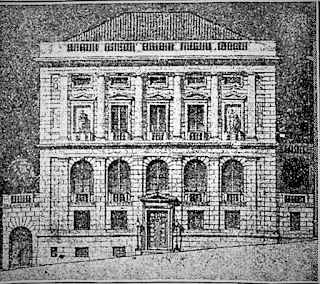 Enlisting the talents of his architect cousin, Charles Pratt Huntington, he announced on November 25 that he would be erecting a museum building for the Hispanic Society. Huntington had organized the group, along with four other trustees, just three months earlier. In announcing the project, the Record & Guide called it "Archer M. Huntington's Princely Gift," and said "Its object is to collect and preserve books, original manuscript, maps, coins and object of art of ancient Spain, especially those connected with its relation to the discover and early history of both North and South America." The site was Audubon Park, north of the city on 155th Street, just west of Broadway, and across from Trinity Cemetery. The limestone clad Italian Renaissance-style structure, said the Record & Guide, "will be five stories in height, three being below ground." The construction cost, estimated at $200,000, rose to $350,000 before completion--making Huntington's total expenditure including the land and endowment around $32 million in today's dollars. The Record & Guide reported "The main floor of the building will contain a large reading-room, balconies and a decorative frieze in Moravian tile representing that portion of Spain's history relating to the Americas...The main hall, which will be in marble, will be lighted by a glass dome." The article added "The terrace will be of brick and marble with a central motive in Moravian tile. In the large reading room there are to be three tablets representing different periods of the Spanish conquest." Huntington's personal collection formed the initial core of the collection. Archer Huntington had only started. 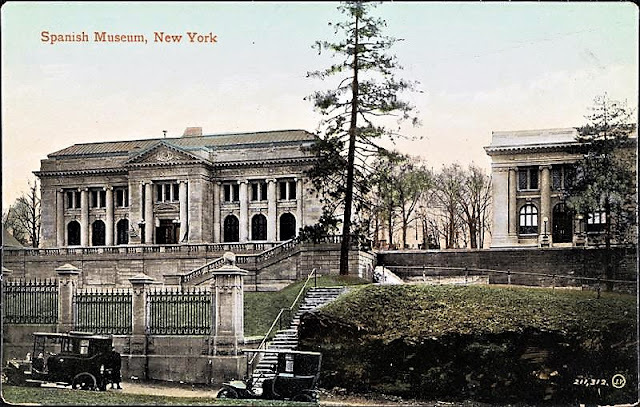 On August 4, 1906 the Record & Guide announced that Charles P. Huntington had drawn plans for the American Numismatic and Archeological Society Building adjoining the Hispanic Society of America museum. The announcement said the projected structure would be "of handsome design, 3 stories high, with a tile roof and will cost about $55,000." Huntington was president of the American Numismatic and Archeological Society, and the museum would house its "large collection of coins, medals and tokens" which the Record & Guide touted was "in many respects the most complete and valuable display in the world." The New York Times reported "The architecture will be of the classic Greek style, the facade being adorned with a spacious porch, Ionic columns supporting a cornice and balustrade. The main floor and the second floor will be devoted to the library, the meeting halls and exhibition galleries." An early postcard shows the free-standing Hispanic Museum and the newly-completed American Geographical Society. When that museum was completed, the two Huntingtons started work on a third building to be home to The American Geographical Society. The oldest institution of its kind in America, it had been founded in 1851 and incorporated in 1854. Charles P. Huntington designed the three-story limestone building in the Italian Renaissance style, blending it harmoniously into the rapidly developing complex. 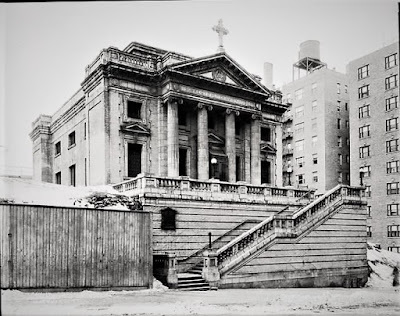 While the American Geographical Society building rose, Dona Manuela de Laverrerie de Barril, the wife of the Spanish Consul General, proposed to Archer Huntington that a Spanish Roman Catholic Church be included in the complex. 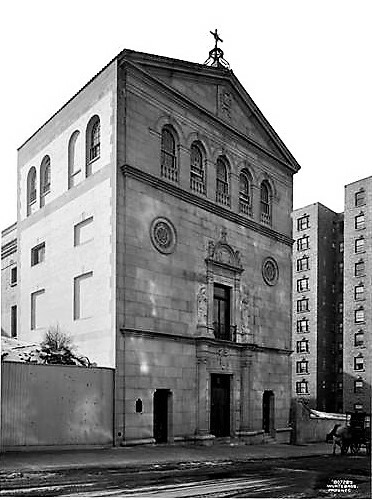 The Church of Our Lady of Esperanza would be the second Spanish language Catholic church in New York City. Once again Charles P. Huntington put pen to paper, designing an Italian Renaissance church facing 156th Street. On April 16, 1911 The Sun reported not only on the new church, but on the complex in general. "The dedication to-day of the Spanish Roman Catholic Church of Our Lady of Hope brings to notice one of the most handsome groups of buildings in Greater New York, if not in the State. It was formerly a high class private residential neighborhood known as Audubon Park, on the very ground where the battle of Fort Washington was fought. The buildings, of which there are four, in the opinion of experts, are the best examples of architecture of the Renaissance type in America." The newspaper hinted that the complex was not yet complete. Charles Huntington, it said "will have charge of all future buildings that may be erected on the ground of what was formerly Audubon Park." And indeed, on June 4, 1916 The New York Times announced "Ground will be broken this week for the artistic building to be known as the Museum of the American Indian on the northwest corner of Broadway and 155th Street. It will be an important and interesting addition to the block, which, under the careful guidance of Archer M. Huntington, has been developed into a distinctive art and educational centre." Once again Archer Huntington had donated the costs and Charles Huntington had designed the edifice. The Times remarked "It will be practically a duplicate of the American Geographical Society building on the adjoining 156th Street corner." Archer was a trustee of the American Indian Museum, founded by George G. Heye whom The Times called "an ardent student and collector of Indian remains." So passionate was he that his personal collection of "everything interesting bearing on the history and life of the American aborigines represented in their numerous tribes," had amounted to over 500,000 items. "It is the largest private collection of its kind in the world," said the newspaper. Heye announced "We hope to make the American Indian Museum a great center for the exhibition and study of the early history and archaeology of our country. It will endeavor to cover its special and individual field in a very thorough manner, being limited solely to America, but embracing both hemispheres, surely a field of study and investigation sufficiently large for the efforts of any single organization." Archer M. Huntington's vision was almost complete, but it would be finished without Charles Pratt Huntington, who died in 1919. Archer donated the land and endowments to the Academy of Arts and Letters. The building was designed by William Mitchell Kendall of McKim, Mead & White. 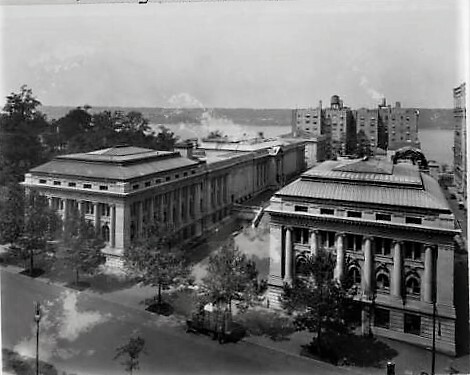 On October 30, 1921 The New York Herald explained "With the laying of the cornerstone of the new home of the Academy of Arts and Letters by Marshal Foch on November 19 will come to fruition the drams of Charles Dudley Warner, Mark Twain, Stedman, McKim, La Farge, Saint Gaudens and MacDowell, who, through the National Institute of Arts and Letters, laid the foundation of the American Academy of Arts and Letters in 1904. "The structure in the dedication of which Marsha Foch figures as a delegate of the French Academy, will provide a permanent domicile for what Prof. William Milligan Sloane, present o the academy, styles 'the nation's council of literature and art.'" Architect William Rutherford Mead explained that Kendall had designed the building in the Italian Renaissance style to conform with the existing complex. There were two entrances, one in the courtyard and the other opening onto 155th Street. "The facades of Indian limestone and Italian in style are arranged to conform in certain principal lines to the adjoining Numismatic Museum." Included in the building was a large library, a meeting room that could seat 50 members, and a large exhibition room conveniently connected to a kitchen for receptions and dinners. Novelist and playwright Hamlin Garland idealistically told reporters that the "American Academy of Arts and Letters will be proud to be of service either in war or in peace. It can be counted on to support every movement for elevating our ideals of living, for preserving the beauties of nature and for upholding the permanent standards of art." On August 11, 1922 the National Sculpture Society announced that Archer Huntington had offered it the use of the undeveloped courtyard lawn opposite the Academy building for "a free out-of-door exhibition of sculpture" to be held the following May. The exhibition committee had originally intended to use Central Park, but Emil Fuchs explained "The buildings upon the Huntington block will offer a beautiful architectural background to the exhibition and the amount of ground available is so great that it will enable the committee to enlarge its original plan." He added "The only conditions which Mr. Huntington made for the holding of the exhibition was that it should be the best that American art can produce in sculpture." The exhibition was monumental, described by The New York Times as "the largest exhibition of sculpture ever held in America" and including more than 800 works. Landscape artists were commissioned to transform the grounds to best display them. Among the esteemed artists whose work was displayed was Anna Vaughn Hyatt whose masterful statue of Joan of Arc had been unveiled in Riverside Park in 1915. The Times described her as among "the twelve greatest living American women" and "one of the foremost women artists in the world." Huntington and Hyatt worked closely together "for several months," according to a reporter, on the arrangements for the exhibition. The relationship between Hyatt and Huntington went from artistic to romantic. Huntington divorced his wife, Helen, and married Anna on March 10, 1923 in her West 12th Street studio, less than two months before the exhibition opened. 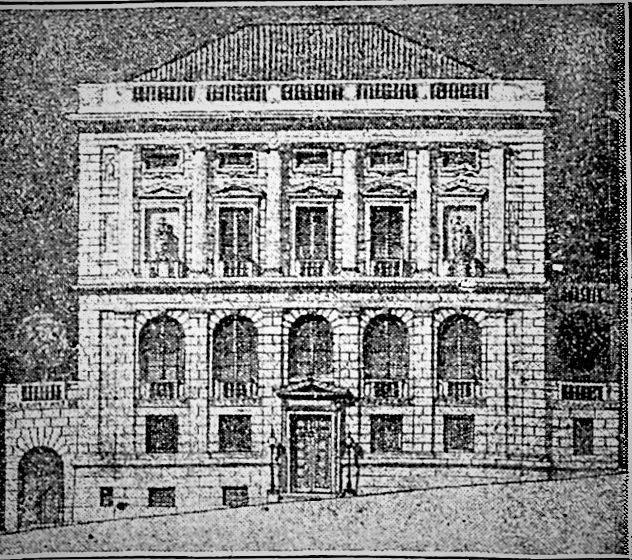 The final piece in Huntington's complex, the American Academy building, would fill the lawn where the exhibition was staged. On November 9, 1938 The Times reported "The American Academy of Art and Letters has received funds to erect a new building facing 156th Street, directly behind the present Academy building. Completed in 1930, it was designed by Cass Gilbert (a member of the Academy). It not only followed the Italian Renaissance theme of its predecessors, Gilbert produced a near copy of the McKim, Mead & White building it faced. Bronze entrance doors executed by sculptor Herbert Adams depicted allegories of Painting, Sculpture, Inspiration and Drama. Inside were a 730-seat auditorium and an art gallery. The 1924, while designing an addition to the Church of Our Lady of Esperanza, McKim, Mead & White made over Charles P. Huntington's facade. The flight of steps was removed and the entrance lowered to 156th Street. The remodeled front took on a more somber, early Italian Romanesque personality. In 1927 Anna Hyatt Huntington's heroic bronze statue "El Cid" was unveiled in the complex courtyard, directly in front of the entrance to the Hispanic Museum. Nine years later, in November, the hall of the American Academy of Arts and Letters was the scene of an exhibition of her works. More than 170 pieces of sculpture were assembled as a tribute to the artist. The New York Times remarked "This is announced as the first comprehensive exhibition of work by the only woman sculptor on the membership roll of the Academy." The neighborhood around the Audubon Terrace complex declined in the second half of the 20th century. Diminished patronage of the museums was perhaps first evidenced in April 1963 when the American Academy of Arts and Letters auctioned off a collection of 435 items, described by the Library of Congress as "a discriminating assemblage of letters penned by most of the major 19th-century American and British authors." The letters had been collected and donated by Archer M. Huntington. A surprising discovery in the storeroom of the Hispanic Society of America in 1986 revealed a 13th-century ivory carving of the Virgin and Child. Purchased by Archer Huntington decades earlier, it had been dismissed by the trustees because it was French, not Spanish. When the associate curator of medieval art at the Metropolitan Museum of Art heard of it, he arranged to see it. "When I first saw it, it was quite dirty," Charles T. Little told a reporters. "But beneath this veil of dirt was a magnificent piece of the 13th century. I recognized it as a masterpiece." Saying that in two decades he had only once seen an ivory or its quality, he estimated that it "would be worth hundred of thousands of dollars." The Society, however (unlike the Academy of Arts and Letters), refused to part with the relic because it had been part of Huntington's original bequest. So a long-term trade was worked out between the museums. The Virgin and Child is now displayed in the Met's Tapestry Hall; and the Hispanic Museum received a silver gilt repoussé plate from Portugal, dating to about 1500. By the turn of the century few New Yorkers knew about the magnificent collections available in Audubon Terrace. Samuel Sachs II, director of the Frick Collection called the Hispanic Society of America "one of the great well-kept secrets of New York," in 2003. While the Frick received about 257,000 visitors a year, the Hispanic Society saw only 20,000. Margaret Connors McQuade, the Society's assistant curator, explained it frankly: "People are afraid to come up here." 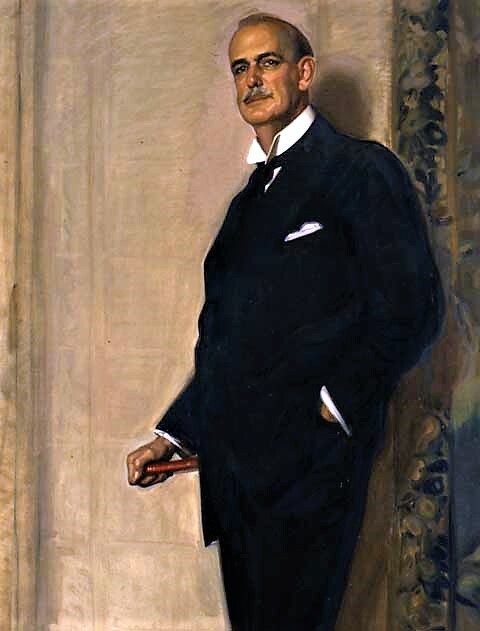 A decade earlier the Society's director, Theodore Beardsley, more offensive. When asked by ArtNews magazine why he did not promote the museum's world class collection more enthusiastically to the local community, he cited the residents' "low level of culture." The openings of the former Museum of the American Indian facing the courtyard have been bricked up. The Society held on, although the American Geographical Society left Audubon Terrace in 1971 (its building now used by Boricua College), and the Museum of the American Indian relocated to the old Customs House on the Battery in 1993. When the American Numismatic Society moved to Lower Manhattan in 2004 its building was absorbed by the American Academy of Arts and Letters. The Hispanic Society of American remained, despite its toying with the idea of relocating in 2006. And although Felicia R. Lee, writing in The New York Times on November 11, 2011 painted a dismal picture, calling its the Audubon Terrace court "a scruffy plaza," the American Academy of Arts and Letters and the Hispanic Society hold on, hoping that the current resurgence of the neighborhood will restore Archer M. Huntington's magnificent vision--once deemed one of the best architectural complexes in America. Regarding the Huntington's collection, I think you meant the painter Theodore Rousseau, not Henri Rousseau. Thanks Tom! You have a lot of readers and I hope this will inspire them to check out Audubon Terrace. It is a beautiful place and the pieces of outside sculpture alone are worth a visit.